Poly zippers made of extra-strength polyester tape with nylon teeth and 1" pull reinforced at top and bottom.100% polyester, machine-washable. Many sizes available to fit virtually any ap­pli­ca­tion. CZ-54-1836 18" x 36" white uncoated polyester with zipper cart cover. 54" post height. CZ-54-1848 18" x 48" white uncoated polyester with zipper cart cover. 54" post height. CZ-54-1860 18" x 60" white uncoated polyester with zipper cart cover. 54" post height. CZ-54-2148 21" x 48" white uncoated polyester with zipper cart cover. 54" post height. CZ-54-2160 21" x 60" white uncoated polyester with zipper cart cover. 54" post height. CZ-54-2424 24" x 24" white uncoated polyester with zipper cart cover. 54" post height. CZ-54-2436 24" x 36" white uncoated polyester with zipper cart cover. 54" post height. CZ-54-2448 24" x 48" white uncoated polyester with zipper cart cover. 54" post height. 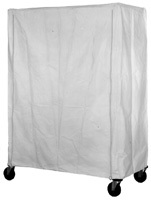 CZ-54-2460 24" x 60" white uncoated polyester with zipper cart cover. 54" post height. CZ-54-2472 24" x 72" white uncoated polyester with zipper cart cover. 54" post height. CZ-63-1836 18" x 36" white uncoated polyester with zipper cart cover. 63" post height. CZ-63-1848 18" x 48" white uncoated polyester with zipper cart cover. 63" post height. CZ-63-1860 18" x 60" white uncoated polyester with zipper cart cover. 63" post height. CZ-63-2148 21" x 48" white uncoated polyester with zipper cart cover. 63" post height. CZ-63-2160 21" x 60" white uncoated polyester with zipper cart cover. 63" post height. CZ-63-2424 24" x 24" white uncoated polyester with zipper cart cover. 63" post height. CZ-63-2436 24" x 36" white uncoated polyester with zipper cart cover. 63" post height. CZ-63-2448 24" x 48" white uncoated polyester with zipper cart cover. 63" post height. CZ-63-2460 24" x 60" white uncoated polyester with zipper cart cover. 63" post height. CZ-63-2472 24" x 72" white uncoated polyester with zipper cart cover. 63" post height. CZ-74-2148 21" x 48" white uncoated polyester with zipper cart cover. 74" post height. CZ-74-2160 21" x 60" white uncoated polyester with zipper cart cover. 74" post height. CZ-74-2436 24" x 36" white uncoated polyester with zipper cart cover. 74" post height. CZ-74-2448 24" x 48" white uncoated polyester with zipper cart cover. 74" post height. CZ-74-2460 24" x 60" white uncoated polyester with zipper cart cover. 74" post height. CZ-74-2472 24" x 72" white uncoated polyester with zipper cart cover. 74" post height. CZ-86-2436 24" x 36" white uncoated polyester with zipper cart cover. 86" post height. CZ-86-2448 24" x 48" white uncoated polyester with zipper cart cover. 86" post height. CZ-86-2460 24" x 60" white uncoated polyester with zipper cart cover. 86" post height. CZ-86-2472 24" x 72" white uncoated polyester with zipper cart cover. 86" post height.